This DVD about the 29th Infantry Division takes place in World War II during the Winter of 1944 and the early months of 1945 in Europe. 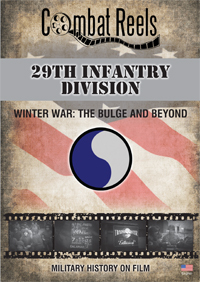 Our Winter War: The Bulge and Beyond DVD begins here and continues to mid-February as a few men of the 29th get to a rest camp in Le Harve, France. The contents of this video show the action as was recorded by the 167th, and 12th Army GP, Signal Photo Companies, during these historic operations. The footage in this video is intended to be strictly that of the 29th Infantry Division and only shows other unit footage when two or more units are intertwined. Combat Reels has located, researched and compiled all of this raw combat film footage, then reformatted it into the DVD format for your viewing pleasure. Some of the highlights included on this 29th DVD are of men at the 29th Division Training Center at Alsdorf, Germany. Then the 29th is shown trying to push to the banks for the Roer River near Koslar and Bourheim. Chaplain services are held on Christmas Eve at a small church in Aldenhoven. Military Police confiscate goods on the black market. Maj. General Gerhardt, Commander 29th Infantry Division takes a tour of his front to visit all of the Regimental CPs. British Field Marshal Montgomery visits and inspects the troops of the 29th along with Lt. Gen. Simpson, Commander 9th US Army. Eisenhower visits and inspects the 29th troops at their positions near the Holland-German border. The DVD closes with some rare scenes that have sound recorded along with it. Men from various units, one from the 29th Div., are issued awards while at a rest camp in LeHarve, France. Enjoy the close up shots of the actual locations the 29th Infantry Division fought for and occupied. Examine as well the the equipment, vehicles, weapons, uniforms, helmet markings and the faces of the men themselves on these candid reels of history.